At the beginning of this month, Vancouver got its first taste of LA's upscale denim line, Joe's Jeans. Started in 2001 by Joe Dahan, Joe's Jeans is a throwback to the days of designer denim, but this time around, with a little more star power and sexiness and less cheap, stapled on bling. With stores across the US, Europe and Asia, the brand has been sighted on celebrities like Gwen Stefani, Selena Gomez, and Charlize Theron. Now Vancouverites can get in on the action with Joe's Jeans' first store at Oakridge Centre. While Joe's Jeans celebrity image and celebrity prices may at first raise your eyebrows, I am a firm believer that sometimes you get what you pay for. Jeans are something you wear everyday, so why not spend a little more for better quality that will last you longer over time? There are the usual run of washes and cuts at Joe's, but there is also a wide variety of printed and color denim options too, like snake print, studded knee embellishments and even digital prints; perhaps a bit too out there for Vancouverites' conservative tastes, but it's nice to see this brand trying! Rolled ankles are all the rage right now, so having a pair already designed for it is just so handy! You all know I've been on the lookout for the perfect pair of leather pants. Well, these coated denim skinnies are definitely in the running. The Skinny is similar to a leather pant look, yet has the seams and stitching of a pair of jeans, which makes these look a little more wearable and less prone to leggings-as-pants syndrome. And what would go seamlessly with those pants? 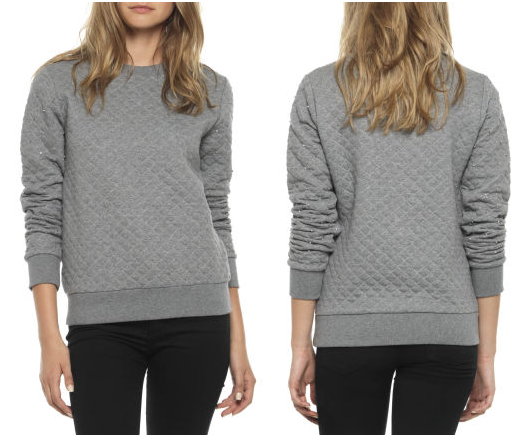 Why this comfy quilted sweatshirt! Tousled blond hair? Sadly not included. 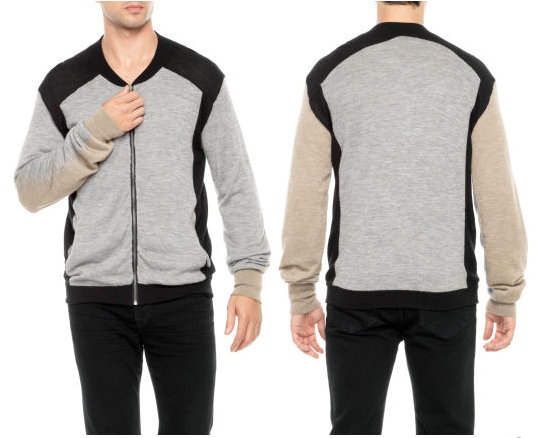 For the men, I love this cashmere jacket. Half sporty, half luxurious, this jacket is perfect for the style-conscious man in your life. 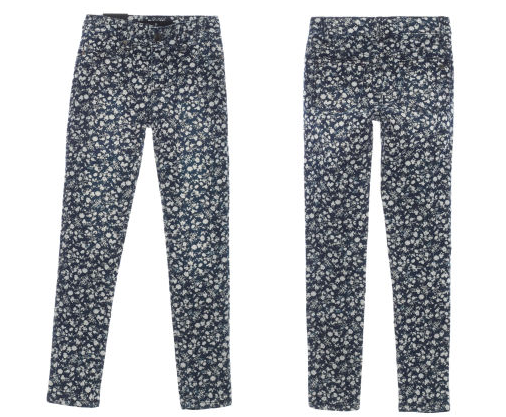 And for the little fashion lovers, there are these adorable floral print jeggings. When I first checked out the Joe's store, I was immediately drawn to the colorful and printed pants like these lying on the table and it took me a couple minutes before I sadly realized that I wasn't fat, it was just that the pants were for children.